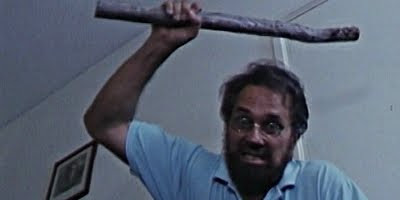 More proof that the tail end of Lucio Fulci's illustrious career ended more with a whimper than a bang. Lester Parson is a habitual gambler who fleeces rich eccentric widows out of their fortunes only for them to be brutally slaughtered and occasionally dismembered for his cannibalistic tendencies. The rich widows in question consist of bearded women with hairy moles,opera singing divas and hair lipped honeys. If any of this seems more like comedy than horror then that would be pretty spot on, infact the plot is a kind of distorted version of Rob Schneider's, Deuce Bigalow, Male Gigolo which Touch Of Death could well have been a twisted influence on. There are a couple of good gore scenes and an Al Cliver cameo but even that can't save this from being an outpost in Plan 9 From Outer Space territory.